Form 6 application result online. The result of the Form 6 appeal is now out. 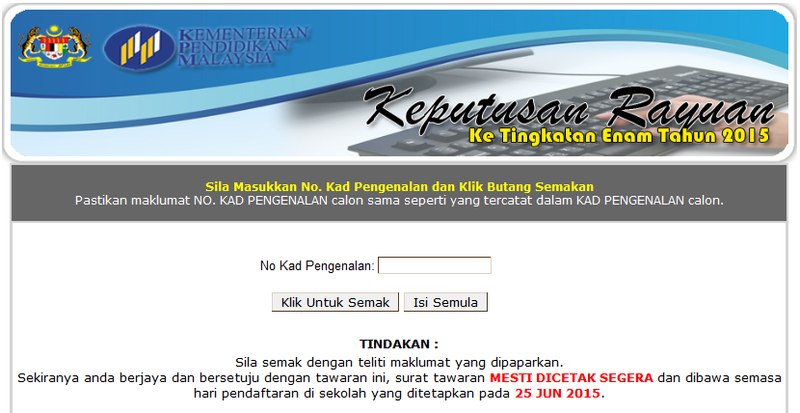 Students who are applying to enter form 6 2015 can now check the result of their application to enter Form 6 , 2015. It is open just for those students who have appealed only. How to check the Form 6 application result online ? You can check online. In box provided type in your Kad Pengenalan. Make sure that the identity card number used is the same as stated in your identity card . You are advised to check or peruse all the information presented in this result carefully . For those of you who want to check your Form 6 application result online we wish you good luck and all the best.